Be part of the 15th Anniversary celebration of The Women of Quail Creek. Our Monte Carlo themed gala will be held Monday, March 18, 3-5 p.m. in the Madera Ballroom. Your $15 ticket gets you $500 in gambling chips, passed appetizers, a sparkling toast and a whole lot of fun! You may even win a prize. Come spend time with friends at this members-only event. There is NO risk to you, it’s all play money designed to promote fun and celebration. ♥️♠️ Join in the FUN! Access THIS FORM or contact Bobbi Gordon at activities@womenqc.com or (520) 625-9353. REMINDER: NO 15th Anniversary Gala tickets will be sold at the Fashion Show. 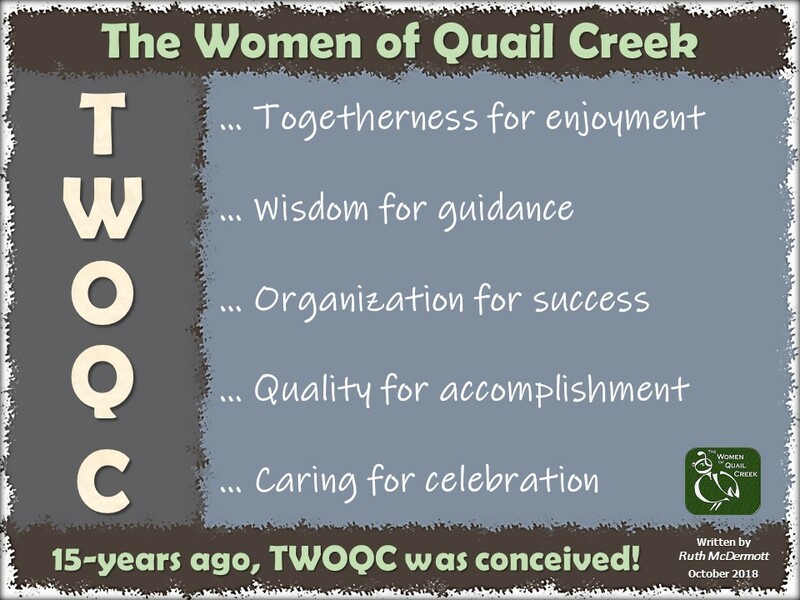 Understanding Women’s Needs in Southern Arizona was the topic of the TWOQC’s first program for 2019. Dr. Krista Millay, Community Impact Director for the Women’s Foundation of Southern Arizona (WFSA) presented a disturbing picture of single mothers who lack additional training beyond high school. Most are living at or below the poverty level. A primary focus of WFSA is to enable families to become financially independent. The WFSA invites all members interested in this worthwhile endeavor to attend their 26th Annual Luncheon on Wed., April 24th, 2019: networking at 11:00 a.m. and lunch at 12:00 p.m. Table and ticket reservations are on sale now: womengiving.org/annual-luncheon. Lucky door prize winners at the January program. Donations are tax deductible as proceeds directly support the American Cancer Society. Donations receipts will be provided upon request. Thank you for your generous support of this event. Our local Mod Pizza has offered the American Cancer Society (ACS) a chance to receive 20% of the sales on February 12th. Hungry eaters need to register online and eat at Mod Pizza from 10:30 a.m. to 10:00 p.m. on the 12th. When at Mod Pizza mention the “American Cancer Society fundraiser through the Quail Creek Fights Back Relay For Life team.” This will insure 20% from sales. Spread the word. One hundred people need to sign up before February 9th for ACS to receive dollars. Money raised by the Quail Creek Fights Back team goes to help cancer patients with education, programs, advocacy and cancer research. The University of Arizona receives research grants from a portion of dollars raised. Marte was born and raised in Boise, Idaho. After graduating high school she continued her education there, and graduated from a business college. She worked as an executive secretary for the Cargill Corporation until she married her husband Ken in 1966. The couple relocated to San Diego where Ken was stationed in the U.S. Navy. After three tours of Vietnam were completed, he was employed as an electronic engineer while Marte began working in the medical field. Marte started out as bookkeeper for several surgeons, then became a medical administrator before earning a medical assistant certification. She then had the opportunity to assist the doctors with minor surgeries as their scrub technician. Marte worked for forty years in the medical field in San Diego and Boise finding it not only interesting but rewarding. She retired at age 65. The couple moved back to Boise in 2013 as their parents were elderly and needing help. After losing their parents, they became snowbirds and found Green Valley. After renting in Quail Creek for three winters and meeting many wonderful people, they purchased a home in Unit 6 where Marte became the Unit Rep. along with one of her neighbors. Ken and Marte travel and take many cruises. They are scheduled for a 30-day Baltic cruise this coming spring. The couple loves living in Quail Creek and enjoying the amenities it offers. Marte believes being involved with all that TWOQC does in the community is a wonderful thing. It’s that time of year again. The Scholarship Committee is working diligently to move forward toward awarding and presenting this year’s awards. The applications for both the high school senior girls and the women-in-transition scholarships are online at womenqc.com/scholarships. The high school applications are due March 5. The women-in-transition applications are due March 15. April 29 at 6:30 p.m. in the Madera Ballroom is presentation night. Be sure to add the date to your calendar. On Monday, March 4 at 7 p.m. Brian Vikander will share his experiences as a National Geographic Photographer. The lecture will take place in the Madera Clubhouse Ballroom and is open to all Quail Creek and local residents. This lecture is co-sponsored by TWOQC Scholarship Committee and the Quail Creek Education Committee. Tickets are $5 by check at the Concierge Desk or check/cash at the door. All proceeds will benefit the scholarship fund for high school senior girls and women in transition. The Military Baby Shower this year is on May 18th. The committee is busy creating wonderful necessities for the families: diaper bags, blankets, booties and hats and many other lovely items. We need your donations as well. Please consider adding a little something for a newborn. Presently there are eight moms on the list but we expect we may have as many as thirty. Donation boxes are in the lobby of the Madera Clubhouse and at Kathi Krieg’s house, 2680 E Sawyer Road. It is time to write notes of thanks to veterans for their service. Please begin writing notes for the Korean War and Vietnam veterans going to Washington DC April 23-24th. There will be 75 participating with 55 who need letters on this special flight. One letter or note will do as Kay Robinson has generously offered to make copies. Multiple letters should be folded and sealed with one sticker each/single letters left open to copy. Ideas for beginning the notes can be found HERE. Bring your notes to 898 N Kenneth Drive by April 8th. Your tribute will remind those who served that they have not been forgotten. Mar. 18 – 3-5 p.m.→15th Anniversary Celebration Party – Monte Carlo: GET YOUR TICKETS! “Thank you” to this week’s contributors: Kathe Alves, Marilyn Beim, Ginny Hutcheson, Yasmin John-Thorpe, Lisa Johnson, Kathi Krieg, Diane Quinn, Kay Robinson, Eileen Sykora, and Julie Woodard.